NOW ENROLLING FOR SPRING SEMESTER! 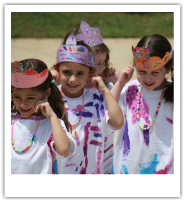 These fun, energetic classes include unlimited creative outlets for children. curriculum includes creative movement, singing, theatre games, vocal projection exercises, dancing, improvisations, mini-scripts and puppetry. addition to bringing home a CD with all the class music! dancing, acting, games, improvisation, puppetry and more! These Jitterbugs also create their own costumes, props, and scenery for a well rounded arts education. Students in this class will be exposed to three different facets of performing; singing, dancing and acting. Each class will focus on one of the three, culminating in a show where we will perform scenes and songs from popular musicals or even Disney films. This class is unique from our other curriculum in that we are inviting guest artists to come in and teach different workshops throughout the semester. This class is going to be tons of fun and offers endless learning experiences for your performer. This class is designed for kids ages 4-8 who love to do it all! This "glee-style" class will create a short movie musical! Jitterbug super stars will create a script, add music, create costumes, film, record all year to find themselves on the big screen at their very own red carpet premier in May! In December, kids will present the trailer to the movie, along with some behind the scenes looks and interviews to prep the audience for their movie musical masterpiece....coming to you this Spring! Calling all performers!!! Jitterbug players are bringing you one of the most loved musicals of all time. Annie for ages 4+! Does your Jitterbug love to be on stage but isn't quite ready or old enough for the full production? Join us for 1 class each month to be part of the orphan ensemble! This group will join the Annie Jr. Class to perform in three hit numbers and a few little scenes in the big show this May! $225 for the full experience! Calling all ballerinas! This intro to ballet class invites your little ones to don a tutu and tiara while they learn the ballet basics. Leotard and tights are not required for class, but we do ask the kids be dressed to move. If they have ballet shoes, great! But if not bare feet will do just fine. We'll pick out tutus at the beginning of each session, do exercises on the ballet barre and across the floor. There will be a recital on the stage at the end of each semester! Jitterbug Mash-up: Can't commit to a weekly class? This is for you! Each week will have a different theme including, but never limited to, Beauty and the Beast, Tangled, Brave, Toy Story, Rock Star and more! Jitterbugs will learn one to three songs related to the theme. At the end of each session parents are welcome to come watch a mini performance up on the stage! Jitterbug Flux-class: This class is perfect for a rainy day or for Jitterbugs with tons of energy that need a little extra fun on the weekend! Experience a new instructional class each time including how to be a princess/superhero, puppet workshop, dance, mad scientist experiments and more! Call us or check our blog/facebook for each week's theme! Cost varies from $10-$15 depending on activity and materials. Class length: 30 or 45 minutes depending on activity. Purchase a Jitterbug Flux Pass! or getting a special group together to create a class let us know!